The documentary film referenced at the end of this video is The Way to Andina. Once the US Congress passed the Expatriation Act of 1907, American women forfeited their US citizenship if they married foreign born men. Naturally American men who married foreign women kept their citizenship because, well, sexism. 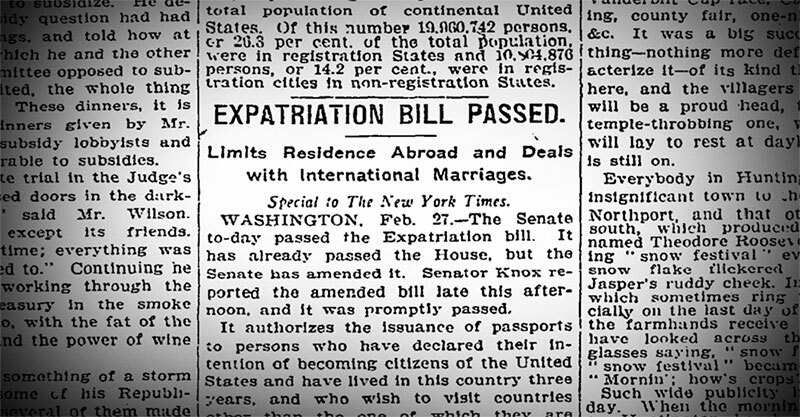 In 2013, Daniel Swalm, the grandson of a Minnesota woman who had lost U.S. citizenship under Section 3 of the Expatriation Act of 1907 for marrying a Swedish immigrant and died without regaining her citizenship, began lobbying Congress to posthumously restore citizenship to women like his grandmother. He contacted his senator Al Franken, who in 2014 sponsored a resolution (S.Res. 402) expressing regret for the passage of the 1907 Act. The resolution passed the Senate on May 14 . The documentary film The Way to Andina details the story of another descendent of a woman who lost her citizenship quite accidentally after marrying a foreign born man (in that case from Colombia).